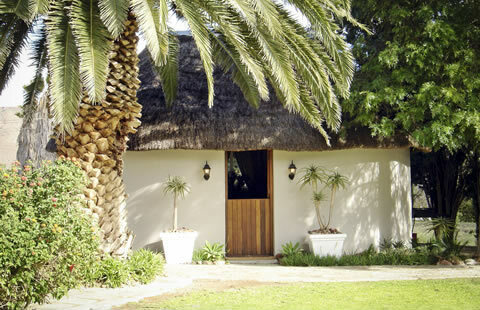 Breathtaking views of a mountain range covered with majestic quiver trees awaits you here at Kareeboom Farm Cottage. The aesthetically decorated cottage consists of a kitchen and lounge with fireplaces in both, a dining room, three spacious bedrooms and two Victorian styled bathrooms. Enjoy watching eagles soaring over a landscape of quiver trees from your own private porch. 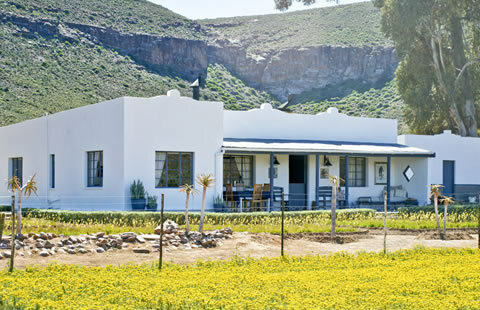 Everything in this cottage was chosen to enrich your experience of the real Hantam Karoo hospitality. The cottage is fully stocked with braai tools, a grill, all the kitchen necessities including glasses, dishes, plates, cutlery etc. PLEASE NOTE Solar panels provide the basic electricity for appliances such as lights and chargers. As a result, electric appliances such as hairdryers, kettles and toasters cannot be accommodated. Old-fashioned paraffin lamps are randomly placed to create a cozy atmosphere during the evenings. The master bedroom provides a stunning view of the mountain range that is filled with quiver trees. All bedrooms are provided with luxurious linen. One of the big Victorian style bathrooms is located on the outside, next to the main house, and it’s a big favourite of our regular guests! This is a spacious and beautiful bathroom where you can take a long and peaceful bath or shower in complete silence. All guests will be supplied with towels. The second master bedroom has a beautiful cast iron bed and unique furniture. More photos of the spacious outside bathroom. A third bedroom contains two, three quarter beds, as well as the enchanting view of the quiver tree covered mountain. Inside the cottage is a smaller secondary bathroom, also supplied with towels and all the basics you might need. A freshly baked bread is delivered to your doorstep every afteroon as well as wood for the cold winter evenings. Homemade farm produce like rusks and soups, a variety of jams and preserved products such as quinces en green figs are availible for purchase. Photo prints of Nakkie van Wyk are also available to purchase. A big dining room table offers the opportunity to enjoy the evening and a great meal with family or friends. The cottage is filled with detail to really make this a memorable experience. The cosy and luxurious lounge with a fireplace will make you feel right at home. Kareeboom farm cottage is perfect for entusiastic photographers, birdwatchers, hikers and those wanting to experience wide open spaces, peace and solitude.